Esta entrada fue publicada en Call for Papers, Encuentros el 7 octubre, 2012 por admin. 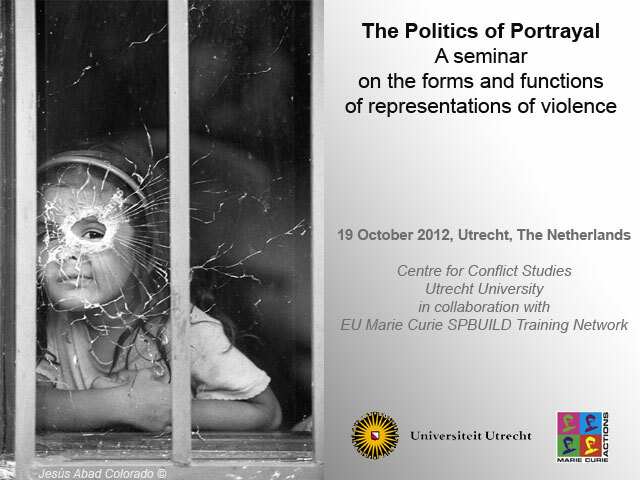 Centre for Conflict Studies, Utrecht University in collaboration with EU Marie Curie SPBUILD Training Network. We invite theoretical and case study based papers from academics (both senior and PhD students) from inside and outside the SPBUILD network. We have a limited budget for travel and accommodation. The aim of this seminar is to gain insight into the historical and contemporary contest between parties for gaining control over the interpretation of violence, i.e., the portrayal of actors, motives, events, ideologies, and places in discourses on violence. The seminar examines – both empirically and conceptually – the ways in which images are constructed and framed, but also intends to gain insight in the functions of portrayal. Drawing on structurationism, we emphasize the need to examine the conditions of possibility for, and the constraints upon the politics of portrayal in particular cases. How do certain representations of violence contribute to (re)producing or contesting the established social order? Why and how are images contested and fought over? What is at stake for hegemonic and non hegemonic actors in these contestations? We conjecture that the politics of portrayal fulfill at least three functions: (1) to recruit supporters for a state or non-state cause by propagating a discourse of othering and belonging;(2) to legitimize action in light of that cause; (3) to gain or continue to hold power over political, economic, juridical, and social measures that support the cause. Methodologically, the social dynamics involved can be accounted for with the help of a multidisciplinary approach that combines elements from frame analysis, critical discourse analysis, and ethnographies of violence. More specifically, we would like to explore questions on discourse formation (how does a ‘hegemonic accord’ arise, how and why are people resistant or receptive to certain repertoires? ); legitimization (how and why do audiences come to accept and support, or resist and oppose the course of action as proposed by protagonists as legitimate and justified? ), and institutionalization (how does this contest translate into political and judicial measures and instruments, e.g. terrorist lists, neoliberal reforms, penal codes, decrees, resolutions, military interventions, detentions, as well as conventions and social rules)? We recognize that the power to portray local incidents of violence, to position them in specific contexts of knowledge, has often been removed from the local societies in which they occur. From colonial racism, to the Cold War ideological stand-off, the War on Drugs and the War on Terror, different systems of “knowledge” have all produced “authorities” who define and interpret local incidents but also, and importantly, act upon these interpretations. The very tendency to place particular incidents of violence into a particular frame often involves reframing, which in turn may contribute to the distribution and persistence of those events in space and time. The portrayal of a bar room brawl as an ‘ethnic clash’, car-burnings in French suburbs as a ‘new intifada’, and sexual violence in the Democratic Republic of the Congo as ‘a weapon of war’ are all examples of how violent acts are increasingly framed in terms that are removed from – but certainly feed into -the local settings in which they occur. We are interested in these framing processes taking place in contexts of violence as well as on how local actors might contest and resist them. It is the dialectics of discourse, in which a variety of actors fight a discursive battle over image and self-image, the justification of violence, blame and accountability, which is at the core of the study of the politics of portrayal. This workshop intends to address the above questions, by inviting a critical discussion supported by specific case studies and theoretical analyses from a range of study areas, disciplines, and practical experiences. Esta entrada se publicó en Call for Papers y está etiquetada con Call_for_Papers, SPBUILD en 4 julio, 2012 por admin. Marie Curie SPBUILD Training Network. We recognize that the power to portray local incidents of violence, to position them in specific contexts of knowledge, has often been removed from the local societies in which they occur. From colonial racism, to the Cold War ideological stand-off, the War on Drugs and the War on Terror, different systems of “knowledge” have all produced “authorities” who define and interpret local incidents but also, and importantly, act upon these interpretations. The very tendency to place particular incidents of violence into a particular frame often involves reframing, which in turn may contribute to the distribution and persistence of those events in space and time. The portrayal of a bar room brawl as an ‘ethnic clash’, car-burnings in French suburbs as a ‘new intifada’, and sexual violence in the Democratic Republic of the Congo as ‘a weapon of war’ are all examples of how violent acts are increasingly framed in terms that are removed from – but certainly feed into -the local settings in which they occur. We are interested in these framing processes taking place in contexts of violence as well as on how local actors might contest and resist them. It is the dialectics of discourse, in which a variety of actors fight a discursive battle over image and self-image, the justification of violence, blame and accountability, which is at the core of the study of the politics of portrayal. Esta entrada se publicó en Call for Papers y está etiquetada con Call_for_Papers, SPBUILD, University_of_Utrecht en 18 junio, 2012 por admin. 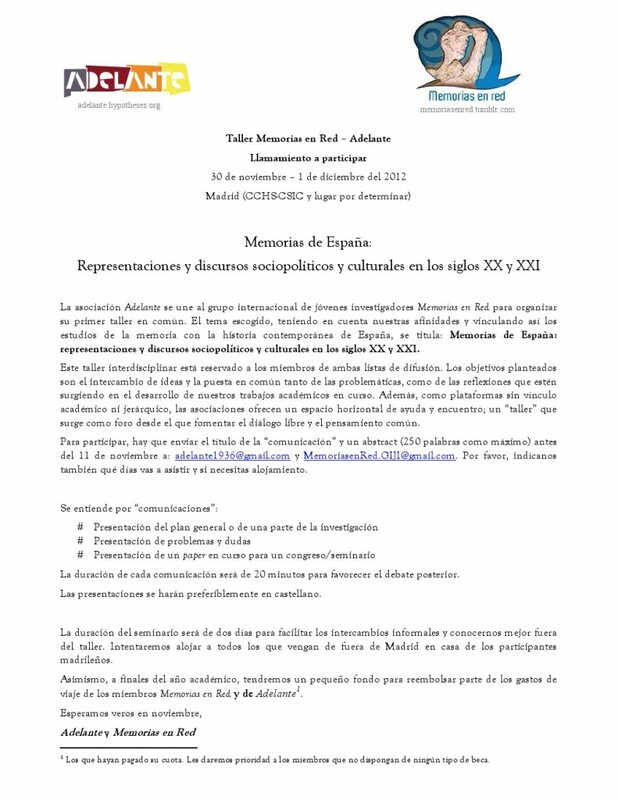 Estamos planeado el próximo encuentro de Memorias en Red en el CSIC de Santiago de Compostela (Galicia) para el 15 de junio sobre la patrimonialización de la memoria (memoria como algo colectiva/publica, memoria como un objeto, recreaciones de memoria, etc.). El programa consistirá de presentaciones de “jóvenes investigadores “por la mañana y después una presentación de un/a investigador/a de Galicia (por determinar). Hay muchos investigadores trabajando sobre la memoria en Santiago (e.g., Nomes e Voces, Historia a Debate, la Universidad de Santiago de Compostela, etc.). Esperamos que sea interesante para tod@s.
Esta entrada se publicó en Call for Papers, Encuentros y está etiquetada con Call_for_Papers, Memorias en Red, Seminario en 23 abril, 2012 por admin. Fecha: Viernes 30 de Marzo. 9:00 – 10:00 Presentaciones breves de textos teóricos sobre la memoria, claves en las investigaciones de los participantes. 10:15 – 11:45 Discusión a partir de los textos presentados. 12:00 – 14:00 Conferencia: Layla Renshaw (Kingston University), Objetos de la memoria: Huellas materiales en la excavaciones de fosas (Rastros y Rostros de la Violencia). Para completar el programa, por favor los interesados enviar un mail diciendo qué texto desean presentar. La idea es hacer una presentación breve de los conceptos claves, resaltando la utilidad del texto para cada uno de los trabajos en concreto. Por favo anexar el artículo que se va a discutir. Esta entrada se publicó en Call for Papers, Laboratorio teórico y está etiquetada con CCHS-CSIC, Memorias en Red, Seminario en 8 marzo, 2012 por admin. “The Arts of Memory”: The Fifth Annual NSSR Interdisciplinary Memory Conference. New York. Playing on the title of the influential text of Frances Yates, The Art of Memory, (1966), where she traces the use of mnemonic techniques from the classical age to the Enlightenment, the fifth annual NSSR Interdisciplinary Memory Conference will focus on contemporary arts of memory. Participants will discuss the arts and artifices of memory practices, both as embedded in physical forms, such as museums and memorials, and in the enactment of memory practices, such as truth and reconciliation processes. Interdisciplinary in scope, the conference reaches for new ways to conceptualize the arts of memory through the visual, tactile, textual, and synesthetic expressions of the past. Other sessions will be dedicated to a reflexive examination of the arts of memory scholarship—the scholarly investigation of the arts of memory investigated as an art in itself. We seek paper submissions from any and all academic disciplines, as well as from memory arts practitioners—empirical, theoretical, and methodological papers are all solicited. To submit a paper, send email to NSSRMemoryConference@gmail.com by December 15, 2011, with “2012 ABSTRACT” in the subject line. Include the following: an abstract not longer than 250 words with a tentative paper title and a short personal resume (200 words maximum) including your institutional affiliation. Decisions will be made by late January 2012. For more information on about the 2012 conference, past conferences, and other related activities, visit www.nssrmemoryconference.com. Esta entrada se publicó en Call for Papers y está etiquetada con Call_for_Papers, Memory Studies, NSSR, submission en 6 diciembre, 2011 por admin.